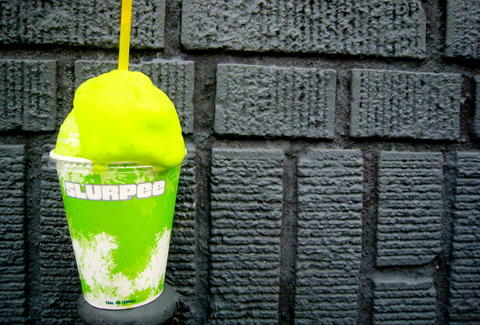 It's become an annual tradition that 7-Eleven's give out free Slurpees on July 11, or 7/11. This year will be no different. Participating 7-Eleven's around the U.S. will have free small Slurpees today from 11am to 7pm in celebration of the chain's 89th anniversary and the 50th anniversary of the Slurpee. Yes, that delicious icy sugar-rush is 50 years young and finally ready to join the AARP. Today's free Slurpees will include the recently released Sour Patch Redberry and the brand new Fanta Birthday Cake flavor, combining birthday cake and vanilla ice cream flavoring. Because it's the golden anniversary of our love affair with the brain-freeze in waiting, 7-Eleven is also offering a promo through their mobile app and 7Rewards program. If you buy seven Slurpees between July 12 and 18, you'll automatically get 11 free Slurpees, which will come in the form of digital coupons inside the 7-Eleven mobile app. Press pause on the diet, because there's a buttload of frozen sugar water waiting for you this week. Dustin Nelson is a News Writer with Thrillist. He loves Sour Patch Kids. Follow him @dlukenelson.